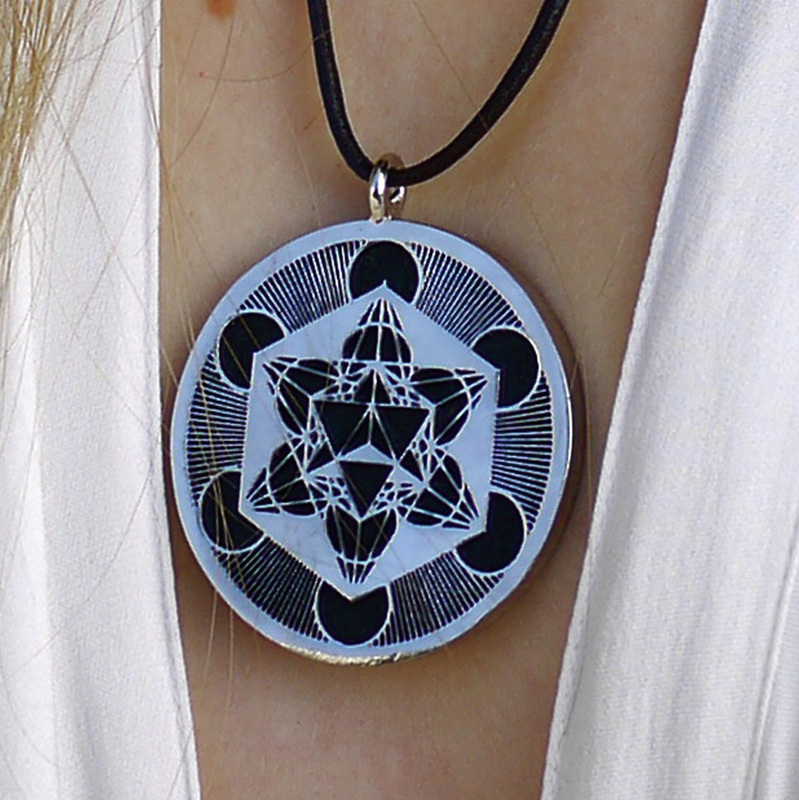 The pendant is used to intensify your ability to create and manifest a reality you love. A known harmonious structure from sacred geometry named after the Archangel Metatron. Metatron appears in Jewish and Christian tradition and in some aspects of Islam. Metatron is in charge of all creation and is considered an Arch angel that is a messager between you and the divine. 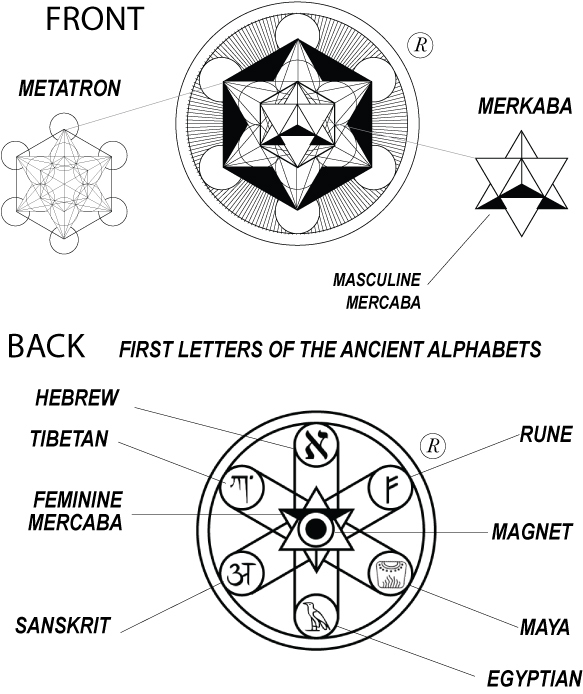 The structure of the Metatron cube arises from the structure of the "Fruit of Life" and found around the world’s ancient sites. By joining all the centers of the "Fruit of Life's" circles it produces the structure which appears as the "Metatron Cube". Concentrating on the structure enables visualization of the silhouette of five, three dimensional, geometric shapes. These are shapes known as "The Perfect Solids": The Cube, the Tetrahedron, the Icosahedron, the Dodecahedron and the Octahedron. These five shapes are the only ones who's vertexes are all tangent perfectly to a sphere. These bodies and their combinations create, among other things, all possible molecular structures. i.e. all of reality. This shape holds all possible patterns of reality and creation. 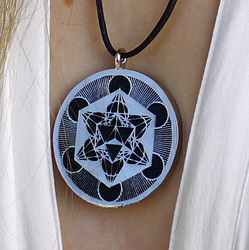 The pendant is used to intensify your ability to create and manifest a reality you love. In ancient times it was also used a protection symbol to protect people and places from harm. In Ancient Egypt, this primal pattern was called the Mer-Ka-Ba. It was actually three words, not one. Mer meant a kind of light that rotated within itself. Ka meant spirit, in this case referring to the human spirit. And Ba meant the human body — though it also could mean the concept of Reality that spirit holds. And so the entire word in ancient Egypt referred to a rotating light that would take the spirit and the body from one world into another. We create our reality with our words, thoughts and visions. Writing is the one of the most powerful tools that all cultures have used to manifest their wishes. On the backside of the pendant are six of the first letters of the oldest alphabet which signify the power of the written word and new beginnings.